A couple of road trains as seen through the windscreen of our car travelling south onthe Stuart Highway south of Darwin NT. Thanks all for taking the time to look and comment. I will try to answer as many questions as possible. Many years ago in the 60's my eldest brother drove the then equivalent of these things. ERF, Foden, and B Model Mack. Based in Mt Isa Qld, he drove cattle from the the NT tablelands to the rail-head at Mt Isa. I was lucky enough as a boy to accompany him on a few trips. The trucks then were rather primitive compared to those now used. No sleeper cabins, no aircon, no turbochargers, no power steering, poor brakes. The roads also were less than ideal. The bitumen sections were much narrower with no passing lanes but most of their travel was on dirt roads out to the cattle stations. These roads were mostly corrugations, potholes and "bulldust". The dust was red, fine as baby powder and hot and thick and resulted from the dry earth being churned up by cattle, horses and trucks. After a truck passsed, the dust plume would hang about in the still air for hours. The high air intakes are one way of preventing the dust from entering the engines. The early cattle trains had only a single deck as opposed to the one shown here and if my memory serves me correctly had a rigid body or "Prime Mover" and two trailers each of about 30 feet in length. The trailer couplings were then far less sophiticated that the type used today on the B Doubles. They were little more than heavy duty versions of the domestic type seen on private cars. They had a turning circle only a bit less than the "Queen Mary" and despite boasts I don't think one was ever backed for any significant distance. It would be a bit like trying to push a chain. As for trying to overtake them on a dirt road it was almost impossible due to the thick dust. It was common to pass on the upwind side regardless of traffic direction. Fortunately there was little traffic on those roads and anyone who was there usually understood the local rules. Best advice is keep out of the way. Thank Bruce nice capture, bringing back some interesting memories of escorting military convoys from Sydney to Darwin. 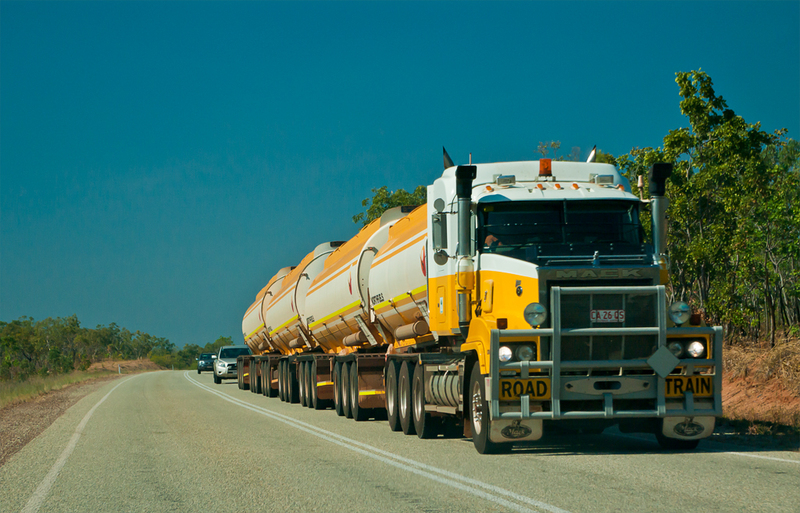 It can be a bit doggy passing one of these Roadtrains on a motorbike at 100kmph (plus). The reason for the raised air intakes is that the air is cleaner when they move off the sealed roads and also cooler. At speed it also gives a ram effect to help with more power as they are only around 600 horsepower and they need every one of them. I worked for a company where they used to gross four hundred tonsand the motors were running 100% loaded, 100% of the time. Thanks for the info Gordon - it makes perfect sense now especially since diesel engines like cold air (are more efficient?). Four hundred thousand pounds of truck....wow, Here in the US the gross limit is only 80,000#. I don't think I could drive something that big, let alone park it. Do you even bother backing up in that? They disconnect the trailers as required to back/park them. As far as stopping them, well no worries there, they're pretty well specced there...but OVERTAKING...well that is another thing altogether..ya used to be able to get'em on the hills, but now some of these trucks have got 700HP+....I think the Volvo has 760, & the Scania has around 740HP, & also monstous torque.....so they don't slow down much!! I drove a small bus/camper back from Darwin to Brisbane many years ago, it was tiny compared to these goliths, We had to get to a good stretch of clear road, look out into the distance and then take the chance of passing, one time it took 15mins to pass one (thats 15mins out on the other side of the road) just getting by, I think it was goint at 100kph, we were doing 103kph. we could see a car comming in the distance, luck, it was 20mins away. 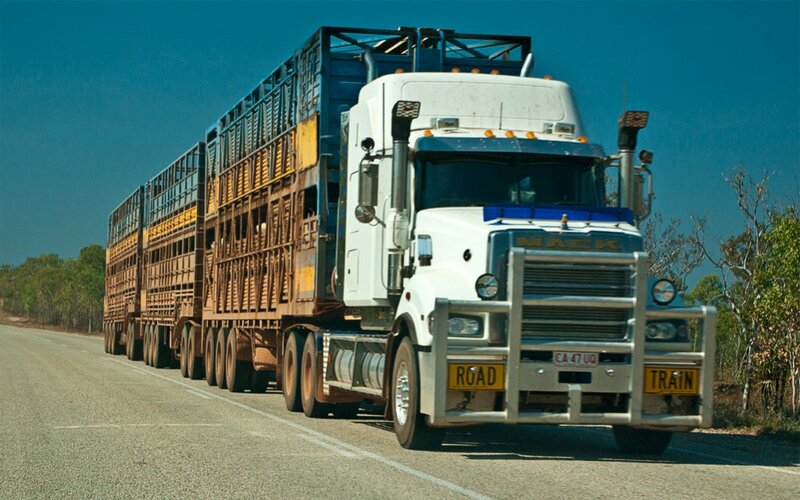 Not sure what its like up there these days, I know when we travelled it, there was a dead roo about every 10metres or so on the road..
As far as backing goes, to get your MC (multi-combination licence) you have to be able to back a two trailer road train 36 metres or a B-bouble 100 metres. When hooking up the trailers you have to reverse the front two trailers back onto the third to get it hooked on, so you learn how to do it or you waste a lot of time hooking up. Four hundred tonnes is actually over eight hundred ad eighty two thousand pounds! The real and original Big Macks ! 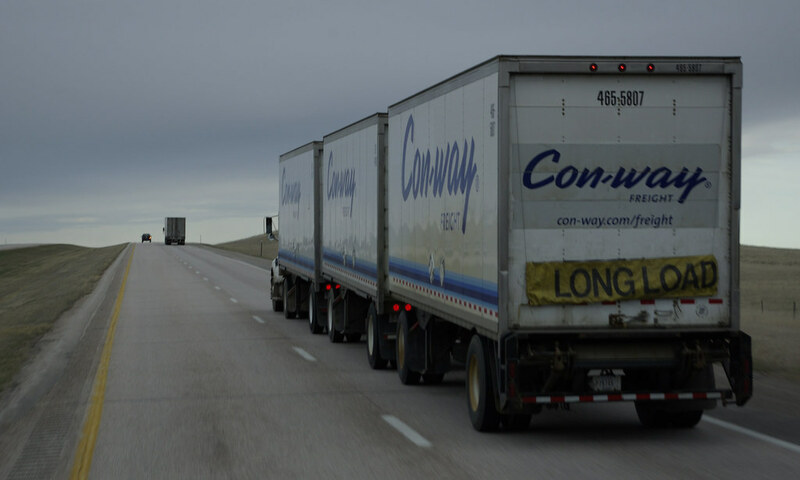 They run double 53 foot trailers in Alberta, Saskatchewan and Manitoba. Certainly not the road trains that are run in Australia, but still a handful for a driver. Wow, I am not sure I have ever seen them with that many trailers on them. That is pretty impressive, and a it is probably a feat to drive one like that to boot! In the states there are the wiggle wagons, sets of 28 foot trailers, 3 in some states, 2 in the rest.